Is The Object At Perihelion When It Is Between The Moon And The Earth? is free found within this website. such are the things you will see you who will come here. 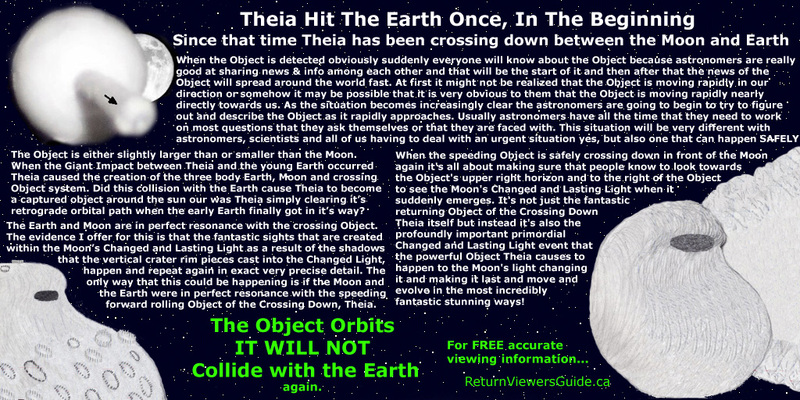 Is The Retrograde Object At Perihelion When It Is Between The Moon And The Earth? 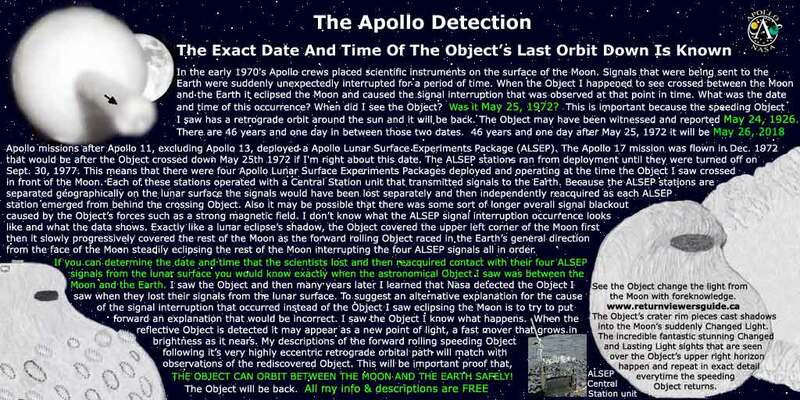 May 25th 1972 might be when my old friend Mike invited me to look at the Moon using his new Tasco 3" achromat small backyard telescope. That was my first time looking through a telescope. I had seen the Moon clearly at least once perhaps twice when on my next turn looking at the Moon I suddenly saw the Object instead in the Moon's place. For a long time I knew that scene that I saw when I looked through Mike's telescope did not match up with the way that the solar system is commonly depicted in books and on tv etc. When I wrote the page Size Scales In Our Solar System And The Crossing Object I gained some perspective that I didn't have before. This new perspective better matched the way things looked to me and certain things that I knew because of seeing the crossing Object. Is the speeding forward rolling crossing Object at it's closest point or approach to the sun when it is in between the Earth and the Moon? 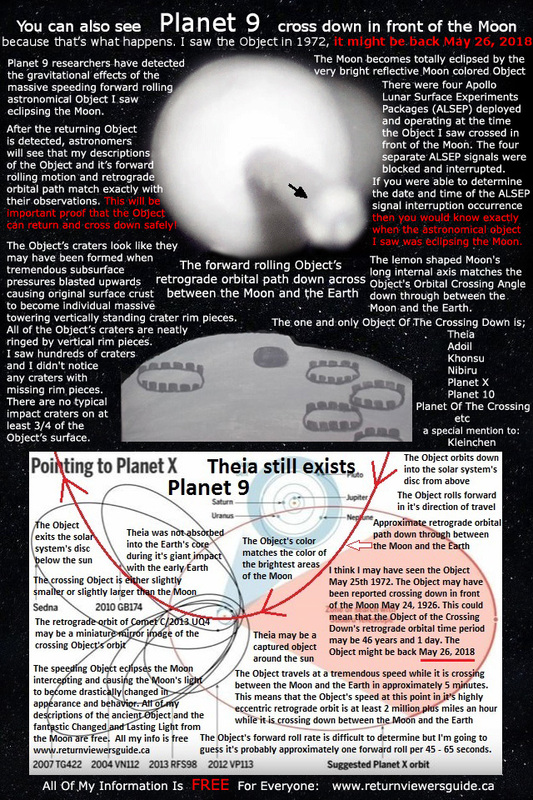 There is a point along the Object's retrograde orbital path that sees the Object at it's closest point to the sun and I always thought that point had to further along the Object's orbital track somewhere after the Object had crossed down between the Earth and the Moon. If there's one thing that I have learned about looking at big fast object's in space at great distances it is this, I can never assume that I understand something completely. It's usually the opposite, instead of understanding something completely very often find out that I only had a partial understanding at best. The point when the crossing Object is at perihelion or at it's closet to the sun might not be where I always thought it would be and today I am wondering if the Object might be at it's closest approach to the sun when it is between the Earth and the Moon. Now I'm going back and thinking about the Object specifically the point in time when the shadow is first seen starting and developing under the newly forming overhang. And I am considering my page Size Scales In Our Solar System And The Crossing Object. Taken together I have to question some of my old beliefs about the Object and also now I am able to realize that I have new questions about the Object. First from my position looking up at the Moon through a small backyard telescope I was able to see a large shadow form under the large overhang that develops out of the Object's raised mound surface feature as the mound travels over the top of the Object forward towards the Earth with the Object's forward rolling motion. The sun, the Earth and the Object and the Moon all line up together. As the Object rolls forward it's mound feature transforms into a steep smooth cliff line and then it becomes the overhang and you can see a place under it where the sun's light is unable to reach. Because of this effect it appears to me as if the sun is high above and behind the Earth when it casts a shadow under the overhang. After the point in time when the shadow forms the Object is sinking lower down as it continues to cross between the Moon and the Earth. Looking at what true size scales in the solar system really actually look like the Earth and the Moon are actually at a tremendous distance from the sun. 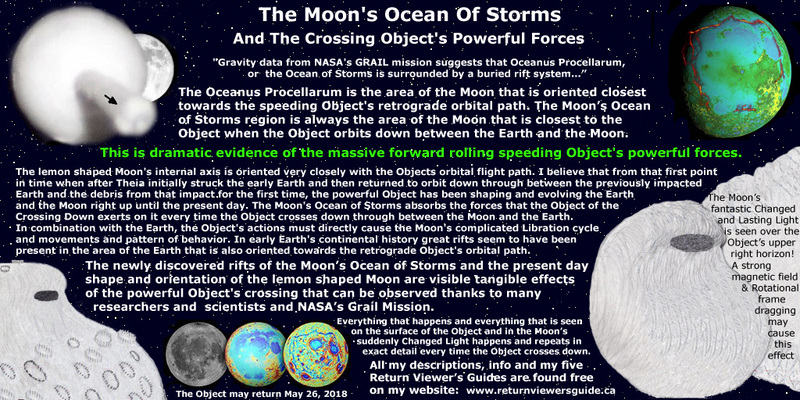 The Object's top to bottom sink rate of motion is approximately one half of the Object's left to right retrograde crossing rate of motion as seen from the Earth as the Object covers the Moon's disc from it's upper left corner to it's lower right corner. At the point when the Object is eclipsing the Moon I think it may already be positioned at least slightly lower than the bottom of the sun after it travels back down into and then through the solar disc at least that's how I have it figured at this point. I am basing this on the idea that if the light from the bottom of the sun isn't able to illuminate the area under the overhang the bottom of the sun must be above the overhang. So now it's already below the sun and at the same time the Object is traveling to the right of the Earth on it's retrograde orbit on an angle to the right of the Earth that is basically twice the Object's downward angle between the Moon and the Earth. Neither the Object's downward angle or it's crossing angle from the left to the right seem like they would take the Object much closer to the sun when you really think about the true size scales of the distances between objects in the solar system and the true distance between the Earth, the Object and the Moon and the very distant sun. Obviously however the Object is headed towards the sun in general. Will the Object's orbital angle down and away from the sun be enough or what it takes for the Object to actually be at it's perihelion point when it is in between the Moon and the Earth or is the Object ultimately still traveling towards it's perihelion position, it's closet approach to the sun after it has crossed down through between the Moon and the Earth? Is the Object at perihelion when it is in between the Moon and the Earth? Is this guess a guess that is truly in the ball park or am I way off in my thinking at this Point? For now unless there's something that comes along that causes me to change how I am thinking about this question I'm going to guess that I might be in the ball park with this guess and that the Object is in fact at it's perihelion with the sun when it is between the Moon and the Earth. We'll see what the scientists actually determine later. 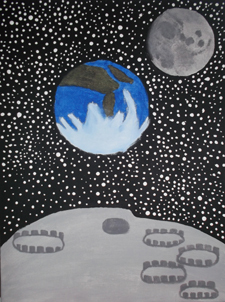 The Object travels at a tremendous speed through between the Moon and the Earth in approximately 5 minutes give or take. Certainly the Object takes less than ten minutes to travel this distance. I used to think it was more like 2-3 minutes but I have at least partially reconsidered and it may actually take up to 5 and even 5 1/2 minutes to travel this distance considering that the crossing angle itself adds distance and time. Could the Object take as long as 6 minutes and a couple seconds to cross through? I have to say maybe because that may actually be the case however less likely 6 minutes or slightly more seems to me. Writing this page caused me to realize that the Object's crossing time could be at least slightly longer than 2-3 minutes. The Object's top to bottom sink rate of motion is approximately one half of the Object's left to right crossing rate of motion as seen from the Earth. 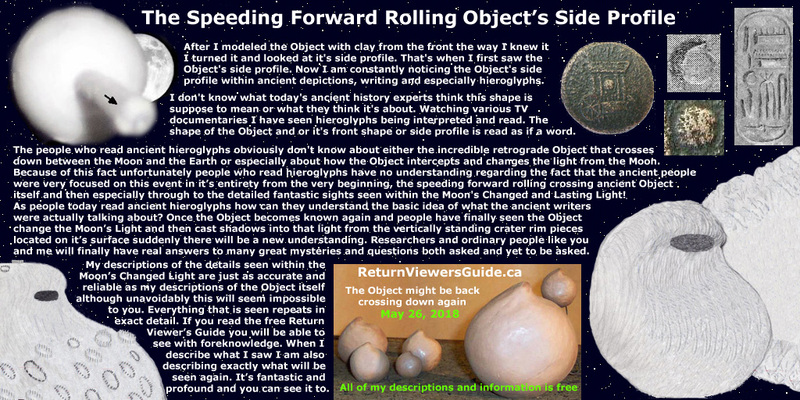 The Object's forward roll rate is difficult to determine but I'm going to guess it's probably approximately one forward roll per 45 - 65 seconds. Similar to when I'm trying to guess how long it takes for the Object to travel the distance between the Moon and the Earth my guesses concerning the Object's forward roll rate also vary slightly and you will find examples of this throughout all of my writing. Even though the Object crosses at a point well out in front of the Moon towards the Earth, it also crosses at a point that is well out from the Earth towards the Moon. I am mentioning this point because I realize that this point can help a person to better understand the image; "The Basic Flight Path." I created my basic flight path image in 2005 with a couple of styrofoam balls and a pipe cleaner when I started my website about the Object and the Changed and Lasting light from the Moon. 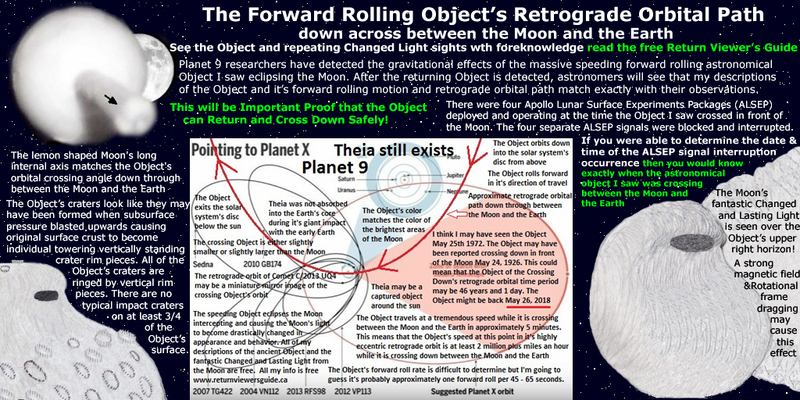 Illustrating the forward rolling crossing Object's orbital path down through between the Moon and the Earth with 100% accuracy is not possible. However in general with a very slight adjustment, The Basic Flight Path image is exactly what the forward rolling Object's orbital crossing angle looks like. Unfortunately there's no way that I know of that would allow me to properly illustrate the Object's incredible speed. Take the Indiana Jones boulder and slow it down and look at it directly in the middle from close up and that does simulate the effect you see when you see the Object however a big difference is that the Object is the size of a small planet and that does have a profound effect on the perspective that viewer has especially when using a small back yard telescope the way I saw the Object. Adjustment: The left to right crossing angle and the top to bottom sink rate shown might be slightly high. Slightly reduce the left to right crossing angle. Also very slightly reduce the top to bottom sink rate angle and this may be a closer approximation than the angles across and down that are shown in my Basic Flight Path Image. 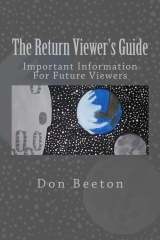 Familiarize yourself with the details and the sequence of events that I describe. Ancient Celestial Object returns and crosses down in front of the Moon. 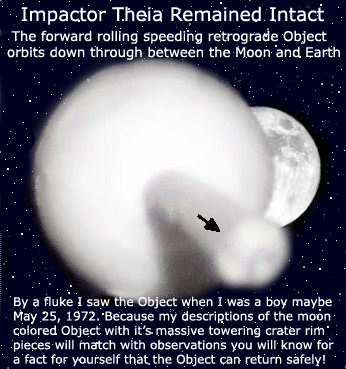 the basic idea of what actually happens when the ancient Object returns & crosses down in front of the Moon.